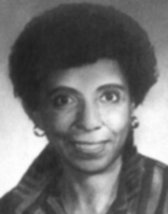 In 1971, Dr. Lauranne Sams organized the National Black Nurses Association and subsequently became its first President. The National Black Nurses Association was organized to help African American nurses. The NBNA is active lobbying for equal rights and pay for all nurses, providing training opportunities and working government and other nursing organizations to improve and change the nursing profession. Dr. Sams spent 16 years teaching at the Indiana School of Nursing. While there she was actively involved in recruitment and retention of minority nursing students. Since leaving the university, the Davis-Sams Distinguished Visiting Professorship was established in 1999. This provides an opportunity for a distinguished leader in nursing to spend a week consulting with faculty, lecturing to students, engaging with the larger community, and like activities. The award was named to honor Anna Mitchem-Davis as the first African American graduate of Indiana School of Nursing and Dr. Lauranne Sams, the first African American faculty member hired in 1958. Both of these women were nursing leaders, helping to open doors for minorities in the nursing field. She then took a position as Dean of the School of Nursing at Tuskegee University in 1974. After retiring, Dr. Sams continued to pursue her post-doctoral studies. There is now a scholarship in her name providing funding for nursing student's to continue their education sponsored by the National Black Nursing Association. The Dr. Lauranne Sams Scholarship provides funding for continuing education. An applicant must be currently enrolled in a nursing program (BSN, AD, Diploma, or LPN/LVN), in good scholastic standing, be a member of NBNA and of a local chapter (if one exists in his or her area), and have at least one full year of school remaining. This specific award is given to a student nurse based on scholastic achievement, financial need, and community service. The amount of the scholarship is $1,000, but the number of scholarships awarded each year varies dependent upon the amount of funds received at the Ecumenical Service held during the Annual Conference.